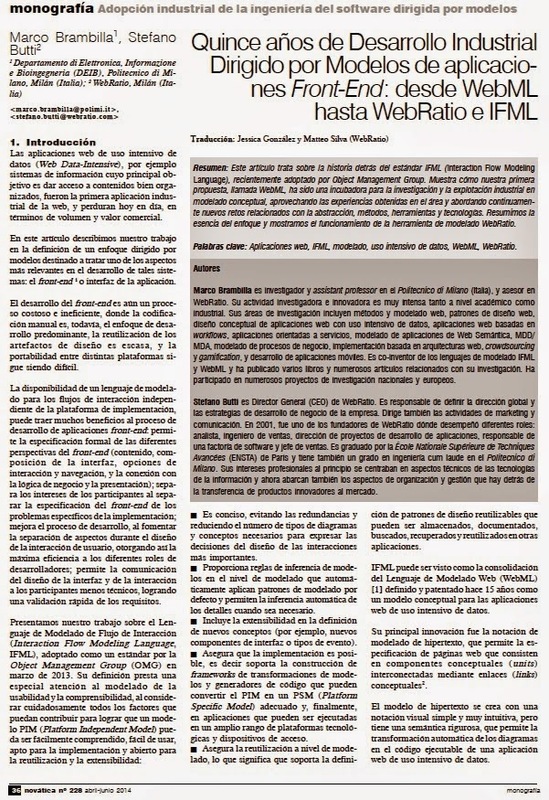 Novatica, the official journal of the Spanish association of Computer Science Technicians (ATI), just published a monographic issue on “Adopción industrial de la ingeniería del software dirigida por models” (industrial adoption of model-driven software engineering practices). Together with a set of interesting experiences mainly in the Spanish market, the issue also features an article about WebML, WebRatio and IFML, written by Stefano Butti and myself, and graciously translated to Spanish by Matteo Silva and the WebRatio team in Latin America. The paper discusses the history behind the standard IFML, recently adopted by the Object Management Group. We show how our initial proposal called WebML has been an incubator for research and industrial exploitation on conceptual modeling, exploiting existing experiences in the field and continuously addressing new challenges concerning abstractions, methods, tools, and technologies. We summarize the essence of the approach and we show the supporting modelling tool WebRatio at work. This journal issue is a valuable resource, especially for Spanish-speaking people, as you will be able to find a comprehensive coverage of the model-driven market in Spain, and more in general some interesting industrial experiences with model-driven approaches (all written in Spanish!). For your convenience, you can find the English and Spanish preprint versions of the articles here, in the form of WebRatio white papers, courtesy of WebRatio and Novatica.